The road continues to slightly rise at 2-3%. I'm sitting third wheel behind two massive guys. We're all the way to the left of the road, which is a bummer because the wind is gusting from the right. I do my best to get as much draft as possible, riding rarely more than an inch away from the dirt. Behind me sits a string of about 20 guys doing the same. I'm pushing 53/14. A couple of times the straight road takes a small dip which means I'm spinning out my 53/12. About a minute ahead, we can see the lead group of 30 in the distance. The chase seems futile: we're barely 30k into the 155k GFNY Argentina and only have these two horses of men trying to get back to front while the rest of us is hanging on for dear life. "Be a Pro for a Day" is the motto of the GFNY World series that now includes events at Mont Ventoux, in Italy, Argentina, Indonesia, Mexico-Cozumel, Uruguay, Germany and Colombia, with the Championship race in New York on May 15, 2016. The motto stands for a true cycling marathon where every rider, from first to last, has the chance to do their best without ever having to stop for traffic. All courses are either completely closed to traffic or police moderated. Each rider is individually chip timed, results are based on finish time and awards are given for overall, age group and team categories. The top 10% of each age group at the GFNY World events qualify for the racer corral at the GFNY Championship. 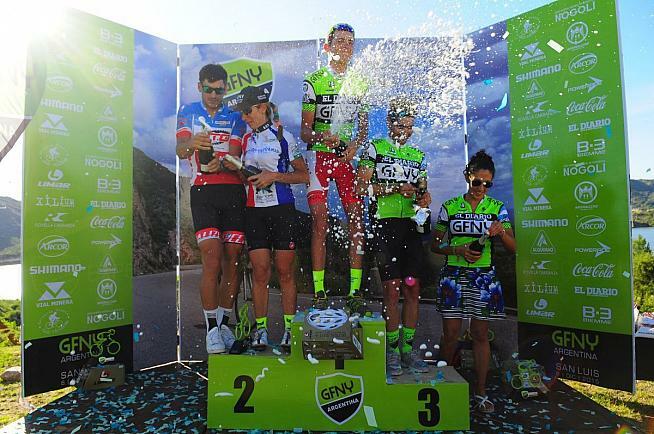 The inaugural GFNY Argentina took place on December 6, 2015 in the San Luis region, an area well known for bike racing excellence. 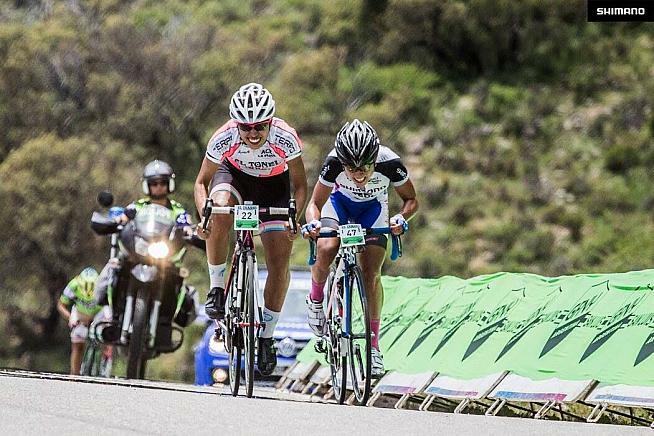 The Tour de San Luis professional races for men and women are the biggest of their kind in South America. Each January, European pro teams flock to the Southern hemisphere summer, to compete and get their bodies ready for the spring classics. The topography is mostly undulating with a few spectacular climbs sprinkled in. Best known is the Mirador del Potrero climb that is 5.7km long and peaks at 1,270m/4166 feet. It sits just outside San Luis and provides spectacular views that reach almost as far as the Andes Cordillera. 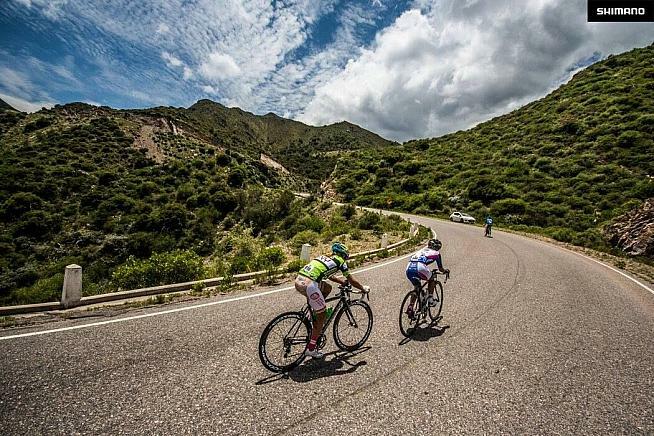 Every year The Tour de san Luis finishes one stage atop the Mirador and GFNY Argentina also climaxes there with the post-race meal back in Potrero, just a curvy and fun 5k/3-mile descent away. The beginning of December means the start of summer in the Southern hemisphere where days are long and San Luis temperatures reach 25-28C. 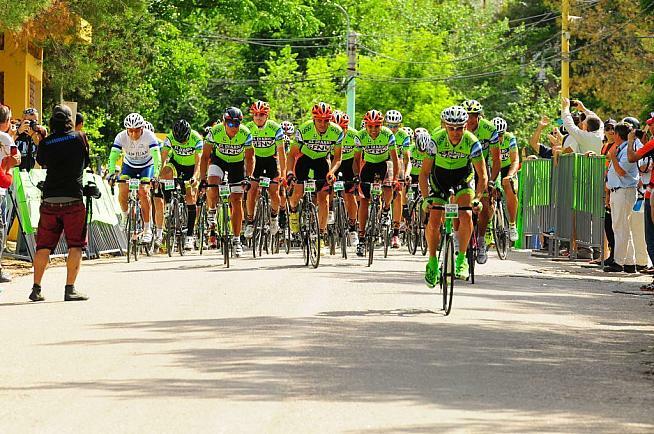 GFNY Argentina starts in Potrero de los Funes, a small vacation town 10km/6 miles from San Luis, situated at a picturesque lake and surrounded by hills and mountains. A racecar track surrounds the lake. Throughout the year, it's used as regular road which makes for fun cycling. This year's race started fast from the gun. 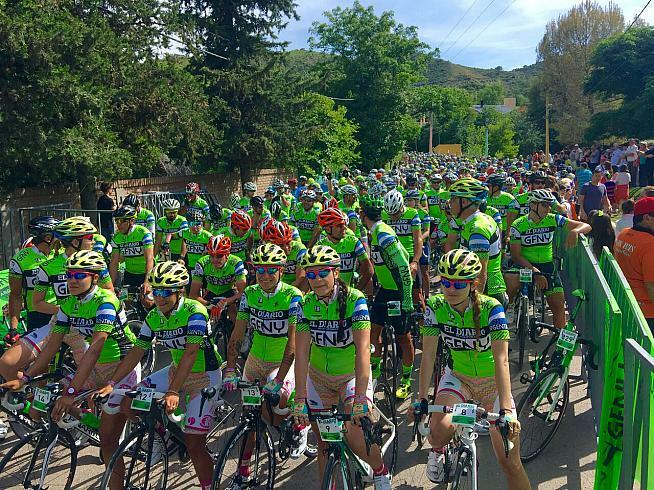 The local Continental team Somos Todos San Luis "drop the hammer" and make sure that the wheat is immediately separated from the chaff. The first 10 twisty kilometers through the town of El Volcan are an all-out affair and I'm soon victim of the pace: relegated to the crop. Just as we reach the straight road to the Lake of Trapiche, I'm waving goodbye the lead group. Around me, others are still desperately trying to close the gap. I settle into a manageable pace and wait for the gruppetto to form. About 5k later, the two horses come up from behind, dragging along a string of riders. The seemingly futile attempt to catch the front again turns into a triumphal success just before we hit Trapiche lake. As we reach the front, I tap the main horse on the shoulders and say "Animal. Incredible." I turn around and spot Luciano Burti, former Formula 1 racer turned GFNY racer. We laugh and shake our heads, knowing well that we're operating on borrowed time here. In the first hour we cover 44.2k/28 miles on a net uphill and there are no signs of a slow down from there. I know that there are two hills along the lake and make sure I hit both of them at the front of the peloton. It provides me a buffer as I get handed through to the back. At the first hill, I just about make it across the crest at the tail end of the furiously racing group. The second time round, a gap opens up with a few meters to the top. I duck down deep and try to sail back to the field on the descent, making it one last time. Back on the main road towards San Luis, the Continental team at the front uses the next incline to get rid of the clutter: me. The team strings out the race in a single file and I'm redlining yet again. A few guys behind me start popping off. I can see the crest but that only means that the pace picks up even further because the riders at the front are already on the descent. I let go. The field slowly pulls away. The neutral service rolls by me, telling me that the race is "up there". Oh really? I turn around and wait for the guys who have been dropped just before me. There is Burti and a couple other familiar faces from the original gruppetto. We get into a decent rhythm and rotate in a Belgian circle. 90k/55 miles into the race, the third group rolls up to us. We join forces into the strong headwind to the turnaround at 120k/75 miles. It's a seemingly endless stretch, mostly uphill but stunningly beautiful. The two-lane highway is all ours. When we see the lead group come back the other way, we know it's not much longer until we get to enjoy the tailwind. I use the tailwind on an uphill section to get rid of a few riders that have been getting a free ride by playing tired or pointing furiously on their legs and uttering something that sounds like "cramps". From kilometer 143/mile 89, the race is a 12k/8 mile climb to the finish. The first 6k are only 2-4% steep but with cross winds. It starts getting tactical in our group. No one wants to lead. It turns into a "race within the race" that makes participating at a GFNY so much fun. We all know that the real race is 10 minutes up the road. It doesn't stop us, however, from the desire to be the best in our 15-man group. We've spent the last two plus hours side by side, analyzing each other's strength, sharing our decreasing water reserves and - most of us - working together to get to the finish faster than the next groups. I keep riding at or close to the front. At some point the pace gets so slow that I decide to go all the way to the end of the group, put in the big ring and "attack" the gruppetto 1k before the beginning of the actual climb up Mirador the Potrero. There is nothing glorious about fighting for 30th place. And yet, we all can't help it and go at it. A short guy, looking like a climber, immediately follows me as if he was waiting the whole time for this moment. A sizeable gap opens up and we begin the climb together. He pulls ahead of me while I try to find a sustainable pace. My legs started cramping a little earlier so I knew I would have to be careful. I don't have a computer or even power meter but ride purely by feel. I vouch to not touch the 39/25 and try to ride as much as possible in 39/21. I keep the climber in sight but knew he would remain ahead of me unless he blows up. A kilometer into the climb, I turn around and see the first three followers two bends below me. I guesstimate 40ish seconds. Shouldn't be a problem if I keep this rhythm. 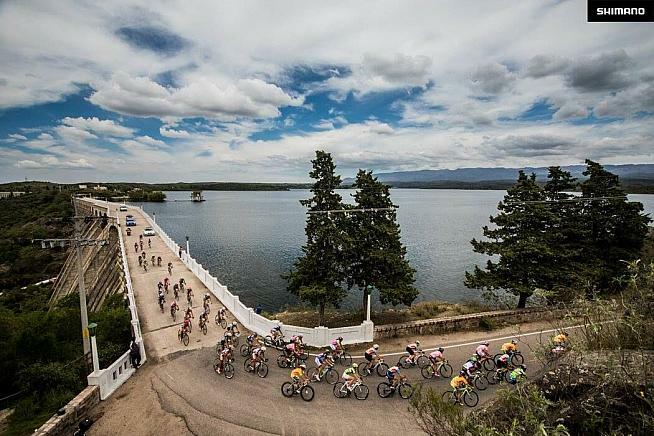 I've done over 100 gran fondos but few have had a finish line as spectacular as GFNY Argentina. Although only 1,270m high, the hill overlooks hundreds of kilometers of plains before the earth rises again in the distance towards the Andes. Finishing there, I felt like it didn't matter whether I was 31st or 331st. Riding and racing outside the traditional cycling stomping grounds in Europe at races such as GFNY Colombia or Argentina, provided me incredible experiences. There is nothing like having a common ground in a tough and beautiful sport like cycling and live and experience it together with riders of a very different cultural background.